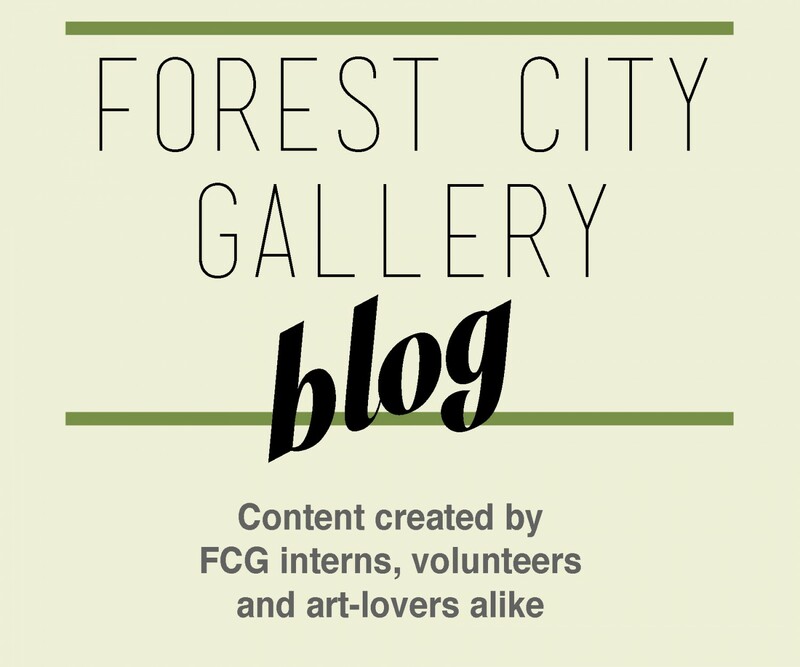 In early December, Forest City Gallery Intern, Dean Keranovic, sat down with Adam Sturgeon and Savannah Sewell before Out of Sound’s Winter Spectacular Festival to discuss upcoming events. 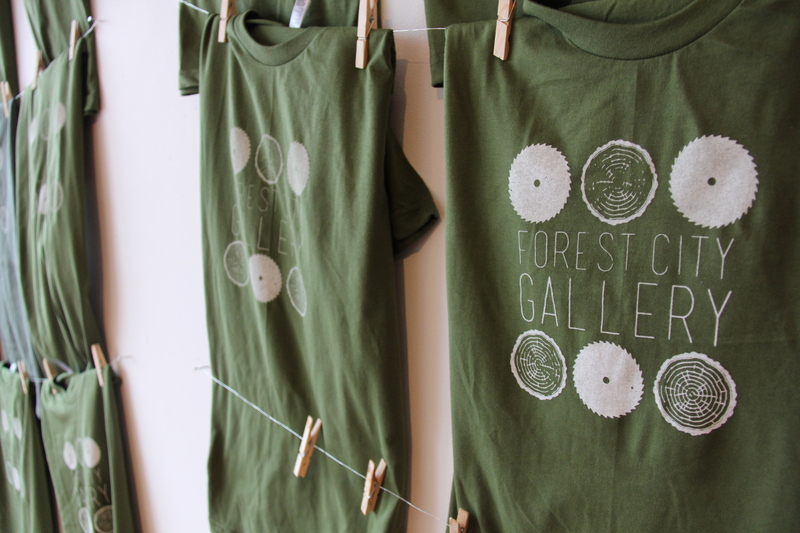 A few weeks later Dean attended the DIY Silkscreening Workshop facilitated by Adam Sturgeon and wrote the article below detailing some of the highlights of the FCG event. When I wrote the teaser article to Adam Sturgeon’s Winter Spectacular event at Forest City Gallery, I never really understood how DIY his method would be. Save for the chemicals and ink, all other equipment can be improvised with household items or can be cheaply purchased. 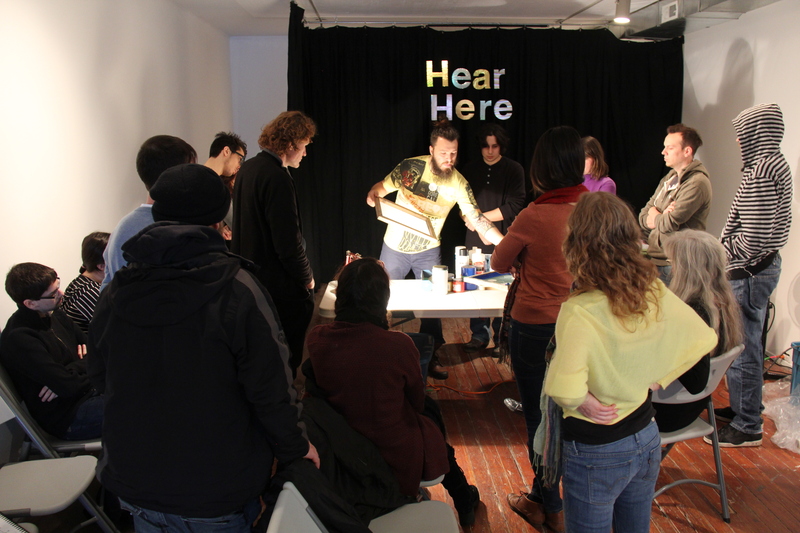 Adam delivered a great workshop that provided the means of making an affordable silkscreen laboratory in your home to anyone with serious intentions of pursuing silk-screening. Though the workshop focused on a simple image design, the knowledge used in the workshop can easily be carried over for more advanced works. The workshop consisted of introducing the equipment needed for silk-screening, how to find them cost efficiently, and then how to use them to get your final print. What surprised me were the similarities with photography. One of the first steps is copying a negative image onto a photosensitive object. Just as photographers use an enlarger to cast a negative image onto paper, silk-screeners burn a negative image onto their stencils via light. Of course, after, the process becomes original to the medium and ink is introduced. From here, it is a matter of clamping your screen and sliding ink over it onto your desired fabric/material. Adam demonstrated the entire process to us, with some volunteer help along the way, but made sure everyone printed their own t-shirt! With an abundance of shirts, everyone had a chance to practice multiple times. Adam’s presentation was all the more inspiring because he brought with him a collection of Out of Sound records and albums, produced by his DIY method. Actually seeing wonderful album covers proves that a homemade silk-screening workshop can deliver professional results; all that you need to succeed is practice with the medium! Adam was totally into people’s questions and concerns about the process or his past works, and stuck around long after his presentation to talk with guests. What really impressed me the most was how cost efficient his process was. Need a new stencil for each image? Nonsense. Instead, cut out the silk in the old frame and add new silk. Think you need an intense UV light to expose your image on the photo emulsion? Also nonsense! 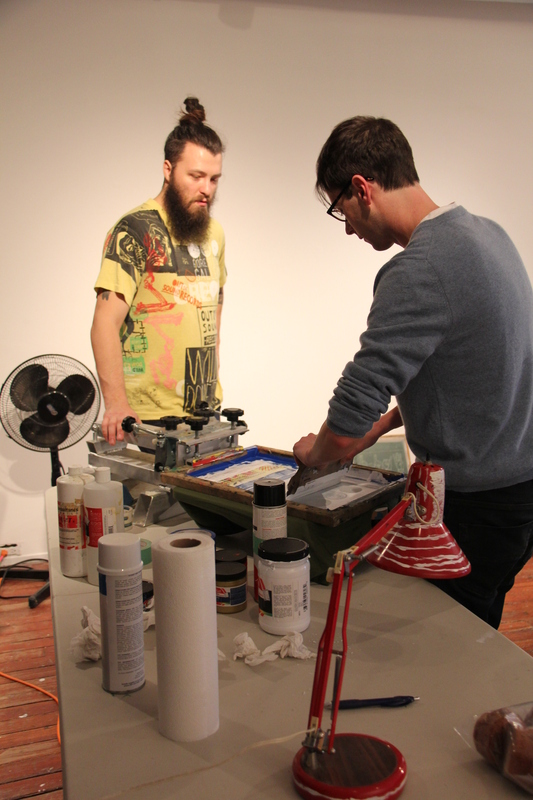 Adam demonstrated that a simple household lamp will do the trick to get your negative on the stencil. Overall, the workshop was a total success. Adam delivered a personalized introduction to silk-screening and gave his guests the means to producing their own workshops. As a beginner, you will surely encounter some problems along the way, but Adam gave us enough information to overcome those problems. If not, trust silkscreeningsupplies.com for their tutorials!